For anyone with ADHD, daily life can often feel confusing and chaotic. But recent studies have shown that the solution to stress and anxiety related to ADHD could actually be more structure at home. In fact, making your home as stress-free as possible and setting up personal routines can create a better quality of life. Oftentimes, children with ADHD have outbursts or emotional meltdowns because it's the only way they can cope with a bout of anxiety. Managing the anxiety first and foremost, then, is the best way to prevent any of those outbursts. For example, parents can set up daily routines for their children, which makes life more predictable. Morning, after-school, dinner, and bedtime routines should be consistent. Try to keep the time that your child wakes up in the morning, eats, and goes to bed each night fairly similar from day to day. Parents can enforce these rules and expectations by making them simple, concise, and clear. The less potential for confusion, the better. This, in turn, maintains a consistency can reduce the stress that comes from uncertainty. And that advice is good for adults, too! Cope with ADHD by keeping your home organized. Getting your home in good shape is also highly effective. The article 33 Ways to Get Organized with Adult ADHD notes that creating regular and consistent lifestyle both in the home and in public life makes a major difference. An easy change to make is having designated areas for items. That way, all family members can easily find all their personal belongings. Similarly, reducing clutter and simplifying what is in each room can stop a child from feeling overwhelmed by all of the stimulation. For example, each child should have a designated area for a backpack, shoes, coats, or toys. For parents, keep designated areas for important items like keys, purse, wallet, or glasses. When everything has its own place, and the family consciously makes this effort to get items in their designated spots, they can be easily found. This helps eliminate the anxiety or frustration people experience when they can't find things. Managing the anxiety first and foremost is the best way to prevent any of those outbursts. From my experience teaching kids, and with parenting my eighth-grade son with ADHD, consistency is the key. My son knows everyday when he gets home from school to put his bag in the closet, his shoes on the shoe rack, and take a shower. When his routine is not interrupted, he is more confident, independent, and has fewer behavioral outbursts. This became even more apparent when we saw what could happen when he broke from his routine. When his lunch period was changed without notice, he suddenly began acting out during lunch. The negative acting out continued for about a week, and we realized that it was because he felt he could no longer predict his routine. Because of his ADHD, he had a hard time coping with that anxiety, and acting out was his way of responding. Children with ADHD can have outbursts due to anxiety. Relieve anxiety by keeping strict routines and making the rules clear. 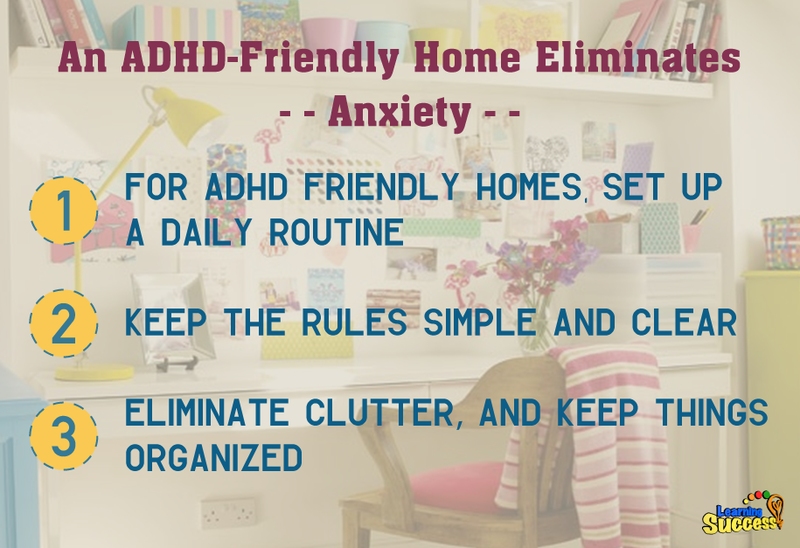 Make an ADHD-friendly home by eliminating clutter and keeping things organized. Making your home and routine ADHD-friendly can make a huge difference for someone with ADHD. Simply being able to manage stress can avoid emotional meltdowns, and get a child on that road to success. We here at the Learning Success System want your child to succeed too, and you can do that by taking our free assessment!